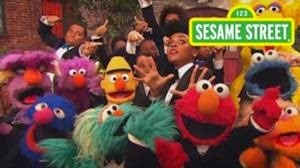 denise Leora madre: Throwback Thursday: Sesame Street's "J Friends"
This week marked the start of Season 45 of Sesame Street. How do I know that? Because I'm a stay-at-home Mom who still enjoys the antics of Elmo n' 'em. And was kinda counting the days. Though much is the same in the neighborhood, some things have changed. Grover is now "Super Grover 2.0" and focuses on technology, science, and engineering concepts. And Cookie Monster is often dispatched to show kids the importance of paying attention to details. But the emphasis on education and entertainment has only improved over the years, and for every other PBS Kids show, Sesame Street remains the standard. I believe its arsenal of songs is part of the reason. A few seasons ago, Sesame Street spoke to the hearts of little brown girls everywhere with the affirming "I Love My Hair," and the video went viral. And when modern artists like Usher and Feist stop by to sing, magic happens. I get the most geeked when they recycle songs from my childhood. In recent years, I've seen remakes of "Ten Tiny Turtles on the Telephone," "Somebody Come and Play," and "The Ladybugs Picnic." But the one song I've been waiting for has yet to be redone. And as they have ways to feature this letter, I don't think they'll ever do it. That's just fine with me though. Because this song, my favorite Sesame Street song, needs no improvement: from its jaunty 70s vibe to the jamming singers, "J Friends" is perfect. And one should never mess with a classic. What's your favorite Sesame Street song?